Silicon Oxide simulates a vintage analog drum machine from the early 1970s, including the ability to play combined rhythm patterns. Patterns and instruments are inspired on the Keio (Korg) Mini Pops 7. One of the beauties of the Minipops is the fixed patterns and instruments, so no pattern editor or instrument tweaks! CLICK HERE TO CHECK IT OUT AND BUY THE APP! MIKROSONIC RD3 Groovebox for Android! CLICK HERE TO FIND OUT MORE ABOUT THE RD3! VINTAGE Roland TR66 Excellent Condition...for sale! 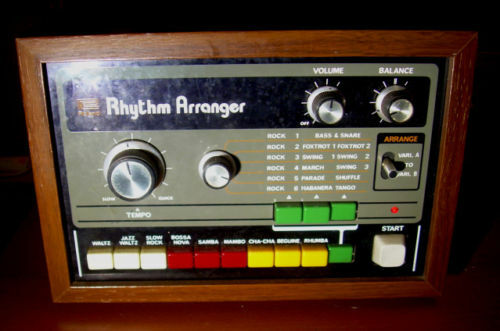 Here we have an original circa 1973 Roland TR-66 Drum machine. It has a variety of presents and sounds, and is very flexible and you will soon find yourself making sounds that you have heard on records from the past. The unit is in excellent condition, there are no knocks or dents to the wooden case, and is electronically sound, no crackly controls. 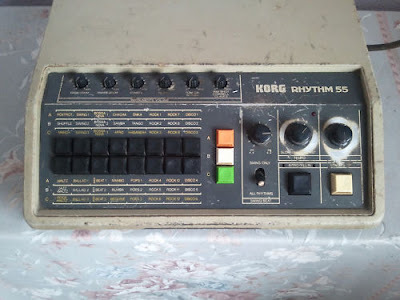 KORG 55....an old workhorse...for sale! Item is well used, complete with authentic cigarette burns at no extra cost. 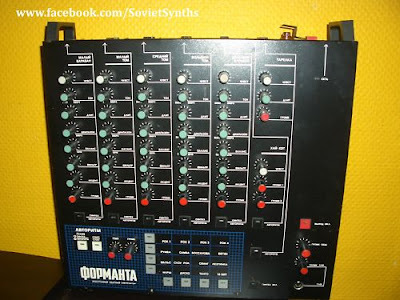 FORMANTA UDS Vintage Analog DRUM Module Beatbox...for sale! RARE Vintage Analog Ace Tone FR6....for sale! 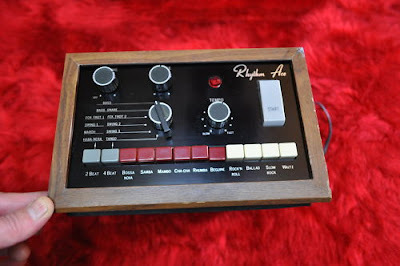 Wonderfull machine...here's a tiny bit of info from the seller!...Vintage Analog Ace Tone (Roland) FR 6 Drum Machine, The Manufacture Made in Japan, Working perfectlly,Has some cosmetic minor damages as scratches dings. 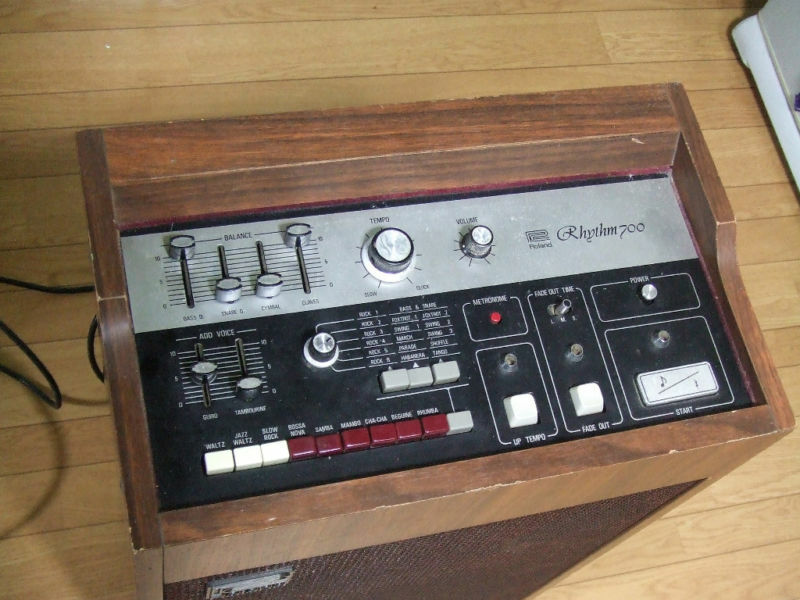 HISTORY in a box!...TR700 for sale! I don't know too much about the history of this machine, but apparently it was one of the first units ever made by Roland. If you're looking for a vintage drum machine that really shows how vintage it is, then this is it. Nothing like this is made these days. Powers up and plays ok, but there is noise when using the almost antique sliders. Comes with built in speakers and various inputs for start / audio input, etc. Shipping is from Japan and is insured. Takes about 2 - 3 weeks, sometimes a bit faster. *Seller is based in Fukuoka, an area of Japan which was unaffected by the recent earthquake and tsunami. CLICK HERE TO GO BID ON THIS AWESOME ITEM! KORG's new analog synth & drumbox! The monotribe Analog Ribbon Station – bringing responsive realtime control to analog groove-making.